We miss the old-school slightly out-of-focus smudged Polaroid cameras. But our nostalgia-specs aren't powerful enough to prevent us getting excited about the new era of digital Polaroid 'instamatics', unveiled at CES in Las Vegas this week. The new Polaroid PoGo Instant Digital Camera prints 2 x 3-inch photos in exactly one minute flat, which is just enough time for you to go and get another couple of beers from the fridge at the house party where you are trying to impress some random girl you just met with your clever new digi-instamatic. "With the push of a button, consumers can select from among the digital photos on the camera, crop or edit them and in less than 60 seconds, print full-color, 2x3-inch prints - all with a single device," reads Polaroid's announcement. The Polaroid PoGo camera is considerably smaller than the old instamatics, weighting in at 10 ounces and measuring a meagre 4.7 inches wide by 3 inches tall. If you are an older reader and don't go to house parties and such (like those Facebook-obsessed youngsters!) then rest assured that the Polaroid PoGo Instant Digital Camera is also sure to be a hit with families at Christmas and other holiday get-together times. The clear advantage over the old-school style Polaroids is the ability to review the pic you just took before wasting another mini sheet of ultra-expensive ZINK Paper (TM) – Polaroid's own ink-free printing technology based on embedded, heat-activated dye crystals, which produces prints "immediately dry to the touch, durable and smudge and water resistant." A Polaroid rep adds: "While many of our most passionate customers tell us "shaking" a Polaroid photo is part of the fun, with any Polaroid photo, the "shake" is totally optional." 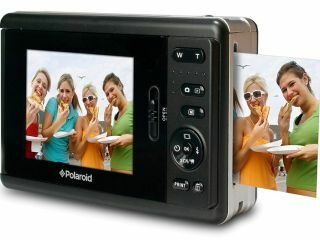 The Polaroid PoGo Instant Digital Camera is out in March 2009 in the US priced $199. Ten-packs of ZINK Photo Paper (TM!) will set American instamatic-fans back $4.99 (or $12.99 for 30 packs). UK pricing and release dates to follow as soon as we get them.